What is Wholand? Wholand is a place, a place on earth but more so a place in our hearts. It's less about the physical land and more about what it does for the soul. Lots of good times with good people. Memories that will not be forgotten but perhaps should be. Why Wholand? If you haven't figured that out by now you never will. But why Wholand.com? To keep the spirit of what Wholand is all about alive long after we are not. 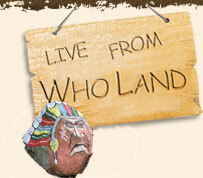 Wanna know where the name Wholand came from in the first place? Head on over to the History section.